More with Music: Be Healthy! The Winter Olympics are in full swing and I enjoy tuning in each night to see all of the events. I have to say that my favorite is figure skating, but I enjoy watching all of the events. Many teachers are incorporating the Olympics theme within their classrooms. Several classrooms I know of are studying topics such as Eating Healthy, the Human Body, the 5 Senses, and Exercise within their Olympic theme. Here's a song that combines a few of the above mentioned topics all in one. 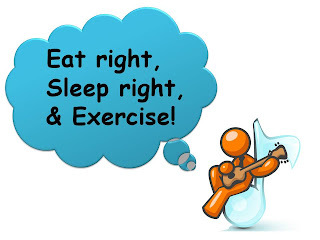 In order to be healthy, you need to eat right, sleep right, and exercise. I wrote this song with a repeating tag line ("Eat right, sleep right, and exercise"), that can easily be recorded on a BigMac switch or on another voice output device. This way, students who are nonverbal or have delays in speech, can participate in singing the song too. Hope you're having a great week so far. Stay tuned for a song about the 5 Senses!